I finally made the decision yesterday to put Kash to sleep. She'd been going seriously downhill the past couple weeks and yesterday I noticed she wasn't walking straight and she was "knuckling" her paws, not straightening them out to lay flat, which is just never a good sign. After writing my blog post the day before, I realized I'd been ignoring a lot of stuff, like the fact I hadn't seen her eat or drink or groom in several days. I also realized that her cuddling in my lap for a few hours a day was not enough to justify her continued living with what was obviously a painful existence that included traumatizing her with medications twice a day and an extra time every other day with the fluids. She bore it all very well (she was the sweetest cat, never bit or fought too much), and within half a minute would be back in my lap on the couch after such sessions, which is why it was so hard to make the decision, but I know she hated it. Akasha Wolf (as my vet calls her) was put to sleep at about 5:20pm, March 6, 2009. She was born in the early morning of March 3, 1994. She had just turned 15. I've been crying so much, my eyes were practically swollen shut yesterday. They're a little better today, and I've been trying really hard not to cry as much because it just hurts, but it's not easy. I just keep thinking of holding her and petting her and how she's not going to be in my lap ever again or curled up on the bed next to me, pinning the covers down and making me too hot. She's never again going to push open the door to the bathroom and come in looking to be pet at that most inopportune time. She's never again going to headbutt me in the arm so hard it hurts, trying to get me to pet her or give her my food. She's never again going to sit in my lap and reach up with her paw to try to touch my face, but instead reach far to the side because her eye-paw coordination was a little off. 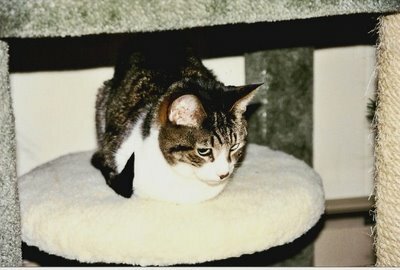 Even though Kash was a really quiet cat, as my wife just said to me, the house feels emptier without her in it. She never really made her presence that known, but I definitely notice it now that it's gone. I really loved her and I don't know how I'm going to get through this, but I know I will. It's just going to be hard. I love you, Kash, and I miss you. My heart goes out to you right now. That is such a hard choice to make. ::hugs:: Akasha was such a sweet cat. She will certainly be missed. Thank you for the hugs. They're greatly appreciated. And yeah, she definitely is missed.